Can we just have a moment of silence – for ourselves of course – because we don’t get to watch Slo-Mo and Jordan Adams anymore? I’m gonna. [pause. 1. 2. 3. 4. 5.]. Thanks. And now, what’s left in Westwood that wasn’t drafted in the first round, I know nothing about. Steve’s kid (it’s Kory pictured above) is still here and Norman Powell returns and I’m very familiar with the name Tony Parker. I just have no idea what this version of TP is going to do on a nightly basis. Steve said that Tony needs to get pissed off. To pile on, there’s only nine of these guys on scholarship. Projected-to-contributes Jonah Bolden (PF, #25 2014 per Scout) and Jon Octeus (PG, 110 Ortg/22% poss, 13/5/2) were deemed academically ineligible; Bolden can stick around the program and practice but Octeus just wasn’t let into the school. UC schools have really tough standards and only let the best-of-the-best into their establishments. I know from experience (#GoTritons). But of the remaining nine on schollie, there’s reason for optimism. It’s a brand new roster of unproven talent (as noted, we know nothing about them). This is now officially Steve Alford’s UCLA. And how awesome is that header image? I’m about to yak forever about UCLA taking jump shots and in that picture there are TWO BRUINS TAKING JUMPERS! Anyhow, chew on all this cud and make your own decision about who wins. UCLA gets 30.8% of their offense in transition. That’s the 11th most in ‘Merica. Additionally, they have the third best steal percentage in the nation (or 11 picks per contest) which leads to that high transition offense. They have the likes of Zach LaVine whom I will celebrate on these pages below via GIF. He’s a long athletic wing-type who can get into lanes. And jump. I’ve read and listened to and watched the Bruins’ ability to get into places they shouldn’t in order to take basketballs away from people. Jordan Adams snags the third most steals per game amongst all of the basketball players (3.5 per). The Bruins use these take aways to run out and try for easy shots. Amongst the top-25 teams getting out into transition (as per % of shots in), UCLA has the highest FG%. To break it down: steal, run, bucket. It’s pretty simple. Meanwhile, Arizona allows teams to get into transition on just 17.4% of their possessions That’s the ninth best transition D we’ve seen this season. It’s well noted what a great rebounding team Arizona is and that helps. But here’s another stat suggesting Arizona’s defense is more Cheddar than Swiss: 13.6% of their defensive possessions are forced into the after 30 seconds of shot clock. I struggle to contextualize this as hoop-math doesn’t rank that number nationally, but because I love you guys I’ve looked through the whole Pac-12 (the things I do for us). Arizona forces the second most late possessions (Stanford leads) in the conference. One more stat regarding timing: Arizona forces the longest possessions amongst all D-1 teams. The average possession for a Wildcat opponent is 20.5 seconds per KenPom. Thursday night that number will be tested by UCLA’s seventh swiftest offense (14.6 seconds). I’m telling you guys: unstoppable force:immovable object::UCLA transition O:AZ transition D.
So what happens? I dunno, but Arizona isn’t GREAT at taking care of the basketball (a pedestrian 106th rating in TO%) so I’m seeing an opportunity for UCLA to do what they do best (stealrunbucket). Shooting Stuff: I’ve examined this one in many places and to many faces. I’m diving into it one more time because UCLA is like kryptonite. Arizona Superman. No one shoots jumpers anymore. But the Bruins do. Arizona plays the pack line defense. Their version of it is meant to protect the rim (15.9% of shots there) and close out on threes (29% of shots at a 28.2% FG%). That leaves the two-point jumper; neither an easy layup nor a valuable three-pointer. Teams are forced to take 54.5% of their offense there when they play the Wildcats. UCLA, meanwhile, has the fifth highest FG% on 2pt jumpers (44.7%), shoots very few threes (26.9% of their offense), and has Kyle Anderson and Jordan Adams. Let me elaborate on those two and it won’t take long: they make 50% of their 2-pt jumpers. 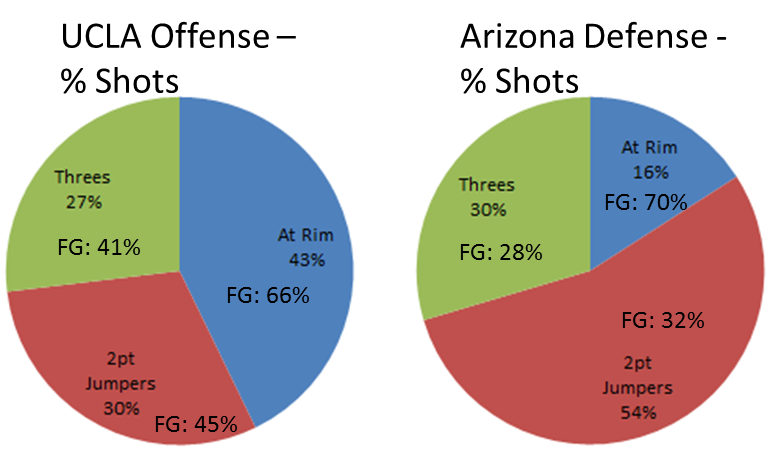 To further synopsize, Arizona forces jump shots, UCLA makes jump shots. WHAT GIVES???? But this is where I might want to elaborate with some less quantifiable information. Namely, I can’t explain to you that Kyle Anderson hasn’t been defended by the likes of an Aaron Gordon. He’s a 6’9″ freak athlete capable of guarding any and everything. As uniquely talented as Anderson is on the offensive side of things, Gordon is as unique on the defensive side. He and fellow freshman phenom, Rondae Hollis-Jefferson, will pose a challenge of athletic length Anderson has yet to see this year. I’m also keeping an eye on this Jordan Adams character. In last season’s he touched the ball game, Adams destroyed the Wildcats: 6-13 for 24 points including 11 FTs. All in Mark Lyons’ eye because Nick Johnson was busy beheading the Bruins, holding Larry Drew II to zero points and just 4 assists. When Johnson drew the Adams straw a few weeks prior in Pauley it was a different story. Adams was 1-5 for 6 points. Yes, I’ll be keeping an eye on that matchup, too. 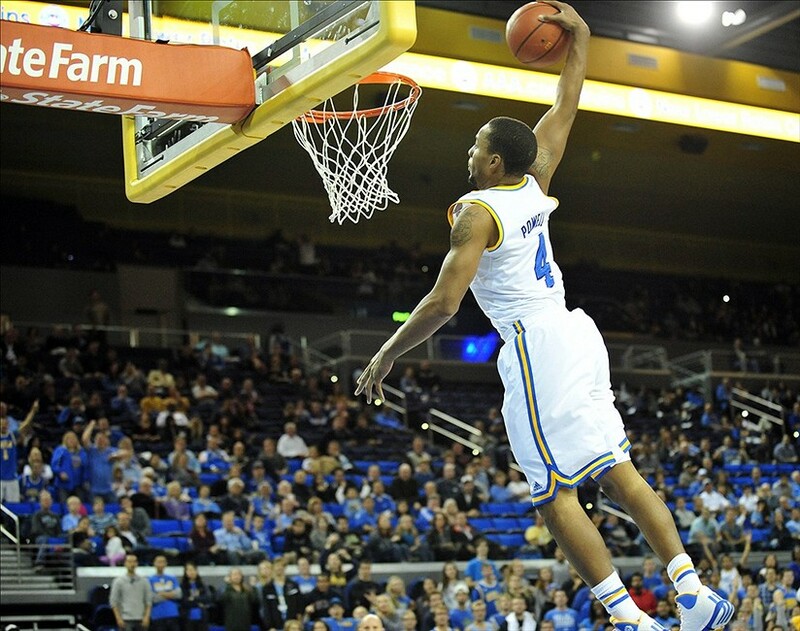 What’s more, UCLA is fairly effective at and around the rim. They’re connecting on greater than 65% of their shots rim-side of which 42.8% are taken. Solid stuff, but wait! There’s more! The Bruins have the second fewest percentage of shots blocked. Likely helping them get those buckets. While the Wildcats don’t block a ton of shots, they dismiss the 55th best percentage of shots. Food for Bruin thought. It’s thought that AZ doesn’t shoot well from deep. Reality is they have the 74th best 3FG% in the nation so they’re really not that bad at all. In fact they’re above average. They shoot the three effectively. They have a ridiculous front court that allows them to make 78.6% of their shots at the rim. That second best FG% at the rim is reason enough for the Wildcats to take more shots at the rim. To elaborate: 34.8% at the rim vs. just 25.4% from three. If I made more than three-quarters of a certain shot, I’d take mostly those. Final Thoughts on the Matter: Is it 6pm PST yet? In my weekly work with All Buffs, I went in on their game against Kansas this weekend. I completely ignored (but for one sentence) their game tonight against Colorado State and charged right in on the Jayhawk tilt because that’s the game that matters. The Buffaloes have proven they can beat formidable foes (Harvard) and otherwise (Jackson State). But what about the big boys? How do they stack up against a team with a number next to their name? They had an opening day shot against Baylor and didn’t fare too well. But I appreciated the effort because they dove into the deep end while others stayed in the kiddie pool. And sure they stepped back into the ankle deep waters for a spell. But now they’re diving right back in which leads me to UCLA’s plunge. The Bruins have been lounging in the shallow waters all the season long. They’ve back-loaded their non-conference slate and I think that’s befitting a program in transition. We’re definitely familiar with the narrative around UCLA and their new coach, so for Alford to have a cake walk into the meat of his first season has been ideal. Considering his first months on the job, with nary a single basket to be made, it was anything but a cake walk. Mix in the motor-mouthed Andy Enfield and UCLA’s 7-0 start has been delightfully under-the-radar (not to mention other coaching related issues in the Los Angeles area). Now on the heels of Myles Jack “historically” winning the football Pac-12 offensive and defensive Freshman of the Year awards, I won’t be quick to speak highly of a UCLA freshman. Those jackolades are myles off. But LaVine may have the highest professional ceiling on this UCLA team. His emergence only makes the Bruins better (duh) as they head into the aforementioned, back-loaded non-con schedule. This quad-pack of games isn’t about to blow your mind but it’s certainly better than the previous seven opponents who hold a KenPom average rating of 190.14. This is the month where we’ll really get to learn the most about UCLA and – more importantly – where they’ll get to learn the most about themselves. Is Tony Parker a foul prone big incapable of staying on the floor? Or is he a defensive game changer, protecting the rim and collecting boards to get scorers LaVine and Jordan Adams into transition? The Wear family. Will Kyle Anderson be a defensive liability as teams become more athletic, more skilled? And the reason we want these things answered, or at least to have a better picture as to the direction of this team, is because we’ve been teased with their talents and have yet to see them challenged. We love challenges at PacHoops. Also heading into the thick of it are the Oregon Ducks (@ Ole Miss, Illinois, BYU), kinda Utah (@Boise State, Fresno State, BYU), and Stanford (@ UConn, Michigan). Yes, we love challenges at PacHoops, who’s going to rise to theirs?